BSPHCL Recruitment 2018: Bihar State Power (Holding) Company Limited has issued official notification for 175 vacancies of assistant engineer, clerk and steno. Eligible and skilled candidates can send Bihar State Power (Holding) Company Limited Jobs 2018 application form through online mode from our official website bsphcl.bih.nic.in. Interested candidates can apply online for BSPHCL Assistant Engineer, Clerk, Steno vacancy 2018 till the last date of 31.10.2018. Candidates can download official notifications from the official website before applying for this vacancy. For getting more information about Bihar State Power (Holding) Company Limited recruitment, qualification given below: Educational qualification, age limit, selection process, application fee and how to apply, important links, courses, admission letter, results, last letter Details like eligibility details. Look around for "BSPHCL Recruitment 2018" for assistant engineer, clerk, steno post. BSPHCL Recruitment 2018: Bihar State Power Holding Company Limited has issued official notification for 2050 vacancies of Assistant Operator, Juniorman. 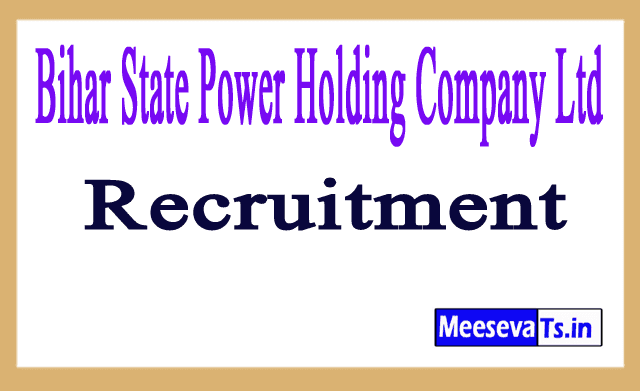 Eligible and skilled candidates can send Bihar State Power Holding Company Ltd. Jobs 2018 application form through online mode from their official website bsphcl.bih.nic.in. Interested candidates can apply online for BSPHCL Assistant Operator, Juniorman Vacancy 2018 till the last date of 08-10-2018. Candidates can download official notifications from the official website before applying for this vacancy. Eligibility details like eligibility details, such as education qualification, age limit, selection process, application fee and how to apply, important links, curriculum, admission letter, results, past papers to get more information about Bihar State Power Holding Company Limited recruitment As shown below. Educational Qualification - Matriculation or its equivalent should be passed from recognized institution. Technical qualification: - There should be an ITI certificate in electrician trade from any institution accredited by National Training Council, New Delhi (NCVT) / Vocational Training Council (SCVT). Look around for "BSPHCL Recruitment 2018" for assistant operator, Junior Linepost post. Look for "BSPHCL Recruitment 2018 for Junior Engineer JE Posts". Look for "BSPHCL Recruitment 2018 for Junior Engineer Posts". Bihar State Power Limited Limited BSPHCL has issued a notice of hiring 350 junior account clerk jobs under BSPHCL Recruitment. All eligible and interested applicants can apply for the online mode before the last date, ie the 31.05.2018. Further details such as educational attainment, age limit, selection process, application fee and how to apply, important links, syllabus, tickets, results.